Thunderkick are one of the best game developers around, with their intricate and innovative designs often wowing players. 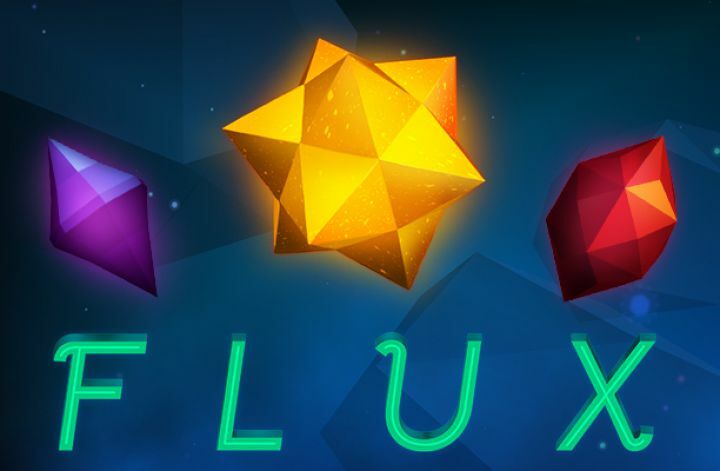 This next slot from their vast library is one such game, Flux is space inspired and we think you will love it as much as we do. Flux is a 5-reel, 15 pay line slot that offers an out of this world RTP of 96.20%. All of the symbols are floating and spinning on the screen in the reel formations. It makes for very interesting viewing whilst the game is in play that’s for certain. Each symbol from high to low is depicted by some form of gemstone, with a glowing 3d effect attached to each one. They spin on transparent reels against a blank background. For this we are happy as the spinning symbols are enough of a feast on the eyes, without anything going on in the background. Bet Amounts – Betting on Flux begins at 10p per spin and can be increased to a maximum of £100 per spin. To amend the bet amount, click on the casino chip icon and select your bet from those available. Once you click on a bet choice you will be returned to the game, so if you aren’t happy with it you will need to click back on the chip icon to change it again. Wild Symbol – Your wild symbol in Flux is depicted with a glowing 3d ‘W’ inside a hexagon shape. It will substitute for all other symbols except the bonus. Bonus Symbol – Following suit the bonus symbol is a glowing 3d ‘B’ inside a squared shape. Land 3 of these bonus symbols or more to trigger the feature. Flux has something special instore for the bonus feature too which will be explained below. Option A – Win Both Ways – if you choose this option, wins can be made from left to right and right to left. Option B – 3 Extra Rows – if you choose this option you will have 3 extra rows added to the reels, meaning you have 5 reels and 7 seven rows in play. Option C – Win Both Ways plus 3 Extra Rows – with this option you get both the extra rows and the ability to land wins from left to right and vice versa. 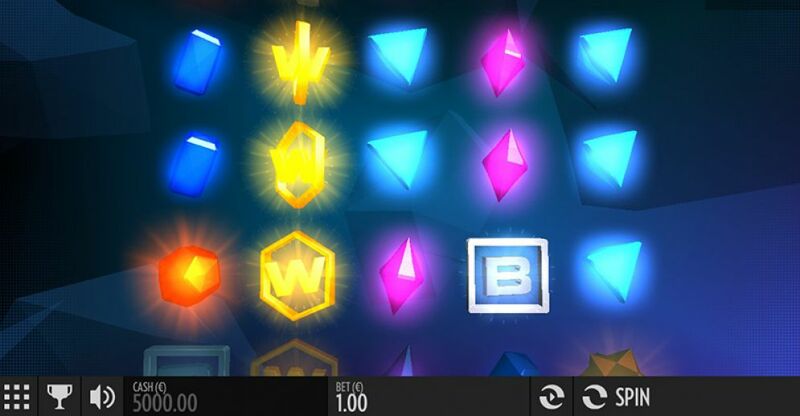 The amount of spins you will be allocated is both determined by the number of bonus symbols you land and the game choice you pick to play. 5 scatters awards – A = 8 bonus spins / B = 16 bonus spins / C = 24 bonus spins. If you land any extra bonus symbols during either of the three options, you will have one extra spin per symbol added to your total. It is entirely your choice which game option you decide to play when entering the round but choose wisely. Flux is an exceptional game considering its simplicity. Thunderkick has once again excelled themselves with a slot that is both fast paced and engaging yet easy to use and understand. The bonus spins are amazing and the design when the extra rows are added, really give it a different look to the usual slots you will see out there. The bonus isn’t that hard to trigger either, but the choice of which option to play is a little more difficult. Tactically any of the options with the additional rows makes more sense, as you would be looking at more potential bonus symbols dropping in. But if you fancy your chances with less rows but more win options its right there for the taking. Overall, we found our wins came often enough whether playing at the higher or lower stakes, the only difference we saw was in the amounts we were winning.